It’s the water you can’t see that can destroy your Foundation. Pitch or tars used to waterproof exterior walls at the time of original construction often deteriorate in 3 to 5 years leaving the walls unprotected against the tremendous hydro-static pressure of a high water table, underground streams and capillarity. Damp spots on your floor and wall. 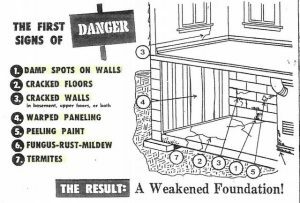 The Results: A Weakened Foundation! Get Eco-Dry Waterproofing Working for You Today! Don’t wait till the next storm leaves water, mold and mildew in your leaky basement. Call us to schedule a free expert consultation today! Feel free to fill out the contact form below to book an appointment with us. Eco-Dry Waterproofing covers all of Northern NJ including Sussex, Morris, Warren, Passaic, Essex, Union and Bergen Counties. We backup our work with a Lifetime Dry Basement Guaranty. © 2019, Eco-Dry Waterproofing. All Rights Reserved.